A few weeks ago, Bronx Pinstripes reader Sasha emailed asking if we could compile an “everything you need to know for the 2019 season” blog. Not wanting to do all that work myself, I enlisted an All Star roster of BP writers to compile all the important Yankees information you need for the upcoming season. Contributing in this blog are Conrad Milhaupt, John Bleh, Mike Gwizdala, Nick Kirby, and Milan Toolsidas. The 2018-19 offseason has been polarizing, to say the least. Fans were angry after losing to Boston in the ALDS and this winter – more than any – fans seemed divided on how Cashman and ownership should run the team. There were many story lines this offseason but the ones that dominated were: Should the Yankees commit $300M+ and 10+ years to young stars Manny Machado and Bryce Harper? Is re-signing Happ and Britton and signing Ottavino and LeMahieu enough to improve the 100-win roster from last season? 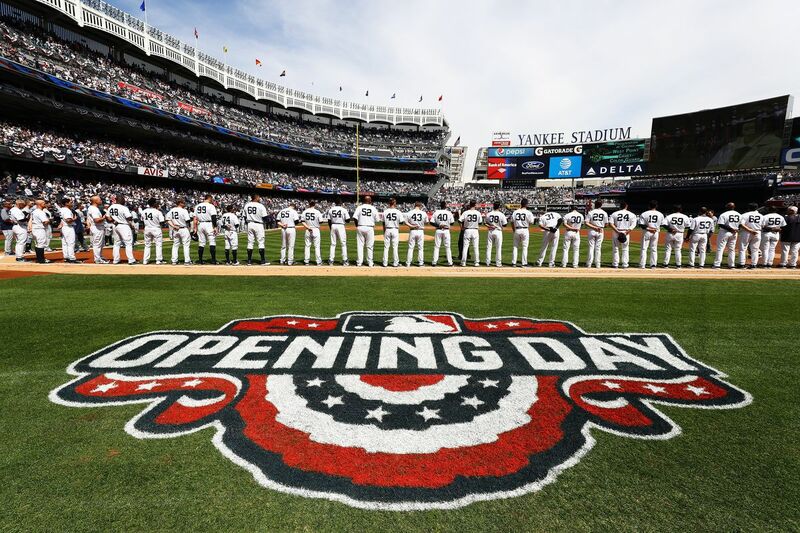 We’re not going to know the answers to those questions for at least a few months, so let’s focus on what you need to know for Opening Day this Thursday in the Bronx. Some of you may remember the infamous moment when Lance Lynn was brought into Game 3 of the ALDS with the bases juiced and nobody out. I certainly do, as I was forced to sit in silent agony in the bleachers as the game — and series — slipped away. Others may recall Neil Walker starting the ALDS elimination game at 3rd base, and Adeiny Hechavarria making a number of cameo appearances throughout the series. For as much as the likes of Judge, Stanton, Didi, and Severino dominate the discourse and collective memory of the team, it takes 25 men to fill out the roster and build a winning team. And while the core largely remains the same, many of those marginal pieces — who become crucial over the course of a grueling 162-game season and postseason run — have changed dramatically. Let’s take a look at the changes to the Yankee roster since the conclusion of last season. Changes will be analyzed based on the shifts from the 2018 end of season active roster to the projected 2019 opening day roster. Note: all stats are 2018 season statistics, with partial seasons for all outgoing Yankees that were acquired mid-season. It is inarguable that the addition of James Paxton to the starting rotation has the potential to be a complete game changer. Replacing the devastating lack of production from Sonny Gray and Lance Lynn with an elite starter like Paxton can vault the rotation from merely average to great. This is to say nothing of retaining JA Happ, a pitcher who has posted a 3.44 ERA over 88 games in the AL East since the start of 2016, rather than the mere months he donned the pinstripes last year. With the Yankees also bringing back beloved CC Sabathia for one final hurrah, the rotation looks primed to have one of the best 4/5 starter combinations in the league. While Severino’s injury is terrifying and puts a damper on the initial outlook for the rotation, the potential full strength staff of Severino–Tanaka–Paxton–Happ–Sabathia would be the envy of almost any team in the league. Few can sport more quality starters from front to back, but more important, in my view, is the potential for this rotation to dominate in a postseason series. Injuries are inevitable, as we’ve already seen. The Yankees are confident in their stable of capable young arms to fill in when needed, and they recently signed veteran Gio Gonzalez to help provide insurance. Even if the rotation suffers, the bullpen is sure to pick up the slack. This relief unit was historically great last year, with five relievers surpassing 1.3 WAR and posting a combined 11.4 K/9 rate. Losing Robertson stings, and many longtime Yankee fans will be sad to see the high socks slinger depart for Philadelphia, but the Yankees have plugged the gap with the tantalizing talent of Adam Ottavino and retaining the services of Zack Britton. I’ve got to be honest, when researching for this article I realized I forgot that McCutchen was a part of this team down the stretch. To be fair, I think the pain of watching Shane Robinson suit up 25 times led me to black out the OF reshuffling when Judge was injured. Nonetheless, McCutchen did a worthy job during his brief stint in New York but is surplus with Judge, Hicks, Stanton, Gardner, Frazier, and Ellsbury (I think?) all on the roster. Truthfully, the biggest change to the outfield is the potential health of Clint Frazier and the possibility for him to platoon with Gardner. After missing all of last year due to a scary series of concussion setbacks, it is time for Frazier to make good on the potential he has shown throughout his years in minors. Gardner is not getting any younger, and Ellsbury should not and will not stand in the way of a developing young talent. If Frazier gets promoted to the majors later this year and wins playing time, he will be the closest thing the Yankees have to an outfield addition in 2019. In terms of the infield, the biggest subtraction is not actually a free agent loss but the absence of Didi Gregorius for a big chunk of this season. Troy Tulowitzki has been tabbed as the savior, and his defensive mobility and pop have been encouraging to this point in spring. Mark me down in the camp that is skeptical of his ability to remain on the field given his history, but thankfully the Yankees will not be placing too much responsibility on his shoulders. The addition of LeMahieu, an elite defender and the latest iteration of the Yankees long desired super utility man, will allow Boone to shuffle the infield into numerous configurations and cover for Tulowitzki should he hit the IL or under-perform. For all intents and purposes, LeMahieu replaces Walker as the regular utility man.He is a clear upgrade over Walker, and increases both the defensive viability and offensive production the Yankees will get from that role. Wade, as he has done in the past, is showing flashes of offense and has already demonstrated elite defensive ability on par with what Hech gave the Yanks late last year. The beauty of the LeMahieu and Tulowitzki signings, though less flashy than a Manny Machado addition would have been, is that there are endless ways for the unit to line up, allowing Boone to optimize offensive matchups, defensive configurations, and cover for injuries and slumps. I know there is a collective grown when the front office discusses “flexibility,” but it is a true value in this infield. The unit will only get better once Didi returns from injury, hopefully by June or July. A headline description of the Yankees starting rotation might go something like: ‘High Ceiling, Low Floor’ or ‘All Risk, All Reward’ or even ‘Oozing Potential, but Health Concerns’… we can’t forget about the health concerns. On paper the starting rotation is an improvement over last year’s. It even has the potential — see above — to be one of the best in baseball. Severino, Tanaka, and newly acquired Paxton all have the ability to pitch like an ace. Happ is as steady a fourth starter as you can find and Sabathia is more than adequate as a fifth starter, assuming he can stay on the field. Alternatively, there are a number of scenarios where things go terribly, terribly wrong. This rotation is unfortunately littered with health and consistency concerns. Breakdowns of each starter are below, along with projections courtesy of FanGraphs ZiPS. Severino perfectly represents the concerns of this rotation. The Yankees ace is coming off of two stellar campaigns that saw him pitch 190+ innings with 220+ strike outs and sub 3.40 ERAs. But before he even had a chance to pitch in spring action, he was shut down with right rotator cuff inflammation and now most likely won’t rejoin the Yankees until sometime in May. Inflammation isn’t the end of the world, but you never want to hear about a pitcher suffering from shoulder issues. Assuming everything is OK, Severino will need time to build up arm strength again, and that means the Yankees will have to piece together a starting spot for about a month. If this injury is nothing to worry about, Sevy should be poised for another top-of-the-rotation season. Prone to bouts of dominance and periods of struggling, the key for him will be trying to stay consistent all year. It looks like Tanaka will get the nod on Opening Day in place of Severino. Since joining the Yankees in 2014, Tanaka has had a wide range of success and failure. He’s pitched as low as 136 innings and as high as 199. He’s pitched to a 2.77 ERA and a 4.74 ERA. Which Tanaka are the Yankees going to get? The team probably would, or at least should, be fairly happy with his performance last season, and would probably take his above projection. With Paxton joining the rotation, Tanaka can enjoy a little less pressure to pitch like an ace. The keys with him will be staying healthy and using his fastball to setup his secondary pitches, particularly his splitter. It will also be interesting to watch his splits between the first and second half, which have been dramatically different the past two years. Yankees fans are hoping the latest Seattle trade acquisition pans out better than his predecessor, Michael Pineda. Paxton probably has the highest ceiling of any pitcher on the staff, but his injury history makes him tough to predict. In his career he’s pitched over 160 innings once — last year when he squeaked by with 160.1 innings. In fact most projections don’t expect him to pitch much more than that, and ZiPS has him pitching even fewer innings. But when he’s healthy, he’s impressive. His high strikeout rate and low walk rate should continue to help him develop for success in his new home run friendly ballpark. The Yankees resigned Happ to a 3-year deal, and why not? Though now 36-years old, Happ has proven himself over a 12-year career and gave the Yankees an incredible performance last season, pitching to a 2.69 ERA across 11 starts. Even if he can’t match last season with the Yankees, and it’s very likely he won’t, Happ needs to only pitch like a capable number four starter. That’s something he didn’t ave the luxury of doing in Toronto, and he can stand tall against any other mid to back of the rotation pitchers out there. Like Severino, Sabathia will also start the season on the shelf, evincing the risks of this rotation. Luckily, his injury is related to a knee scope, not anything arm related, and he’s serving a five game suspension anyway. Sabathia is back for one final year before riding off into the sunset (read: work for ESPN) and all he needs to do is be a capable number five starter. Additionally, CC remains a strong leader and clubhouse presence. Given the injuries to Severino and Sabathia, it looks likely that Luis Cessa and Domingo German will both break camp as part of the starting rotation. Both are having an excellent spring. German’s the more exciting player, and has seen mixed success in limited starts. He’s always had control issues, but thus far in spring his walk rates remain low. Cessa has teased decent pitching in the past but has never really put it all together. At this point in his career he seems a spot starter at best. Perhaps April is his chance to prove everyone wrong. Jonathan Loaisga is now ranked as the best pitching prospect in the system, but struggled in 5 spring games, pitching to a 7.50 ERA and 1.417 WHIP. Despite struggling, Boone indicated Johnny Lasagna will be called up when CC goes on the IL following his suspension. The interesting wildcard comes in the form of Cashman’s final free agent signing: Gio Gonzalez. At this point, it’s unclear if he’ll ever see major league action with the Yankees as he signed a minor league deal with an opt-out on April 20th. Gonzalez had a great run from 2010-17 with Oakland and Washington, but struggled in DC before being shipped to Milwaukee last season. Amazingly, he’s still just 33 and the Yankees may catch lightning in a bottle. Either way, it’s an impressive signing by Cashman given his past performance and what looked to be a decent market for pitching this offseason. What can you expect from the Yankees bullpen in 2019? Strikeouts. Popping radar guns. Wipeout sliders. Knee-buckling curveballs. Demoralized opponents. And more strikeouts. Aroldis Chapman, Dellin Betances, Zack Britton, Adam Ottavino, Chad Green, Jonathan Holder and company make up the best bullpen in baseball and it isn’t even close. Yes, they did lose David Robertson, a fan-favorite and insanely versatile reliever. Over the last season and a half since the Yankees acquired him from Chicago, DRob pitched in every scenario imaginable: short relief, middle relief, setup man, closer, and fireman. Houdini lived up to his reputation, holding hitters to a .183 BA with runners in scoring position last season. He’s worth every penny the Phillies paid him this winter. It also doesn’t hurt that Otto is a local kid who grew up a Yankees fan. As I’m sure you’ve heard, he will be the first player in franchise history to wear No. 0. The Yankees should get good return on their $27M investment they made in Ottavino this offseason. The rest of the big guns in the bullpen are familiar faces. Aroldis Chapman, Dellin Betances, and Chad Green have been stalwarts for the past few seasons. Chapman missed time last year due to a knee injury, so a full offseason should do him good. Betances will begin the year on the injured list, but as long as he isn’t out for an extended period of time, the bullpen won’t suffer. I’m curious how Boone uses Green, who was good in 2018 but not nearly as dominant as he was in 2017 when he posted a 1.83 ERA, 1.75 FIP, 0.74 WHIP, and 13.4 K/9. That season, Joe Girardi often used him for multiple innings with at least one game off in between. Boone used Green more like a traditional 1-inning reliever last year. Zack Britton may have changed the spelling of his name this winter but he did not change his team. In 25 games for the Yankees after being acquired from Baltimore, Britton posted a 2.88 ERA but a contradictory 4.08 FIP. At times Britton was vintage, pounding hitters with hard sinkers. Other times he would lose the strike zone and look lost. The general consensus on Britton, who agreed to a multi-year deal to return to New York, is that the further he moves away from his Achilles injury the better he will be. I have yet to mention Jonathan Holder, who was sort of an unsung hero for the Yankees last year. He posted 1.0 WAR in 66 innings, but declined a bit in the second half. As the sixth man out of the bullpen he is more than adequate, seeing as how he is good enough to close games for the Red Sox this year (seriously, their bullpen is trash). Whoever rounds out the Yankees bullpen — Tommy Kahnle, Luis Cessa, Domingo German, Jonathan Loaisiga, etc. — will be gravy. Fangraphs’ Dan Szymborski, who appeared on The Bronx Pinstripes Show last month, projects the 2019 Yankees bullpen to be the best in history. Aside from catcher Gary Sanchez, the Yankees will sport an entirely different starting infield on Opening Day 2019 from the one which took the field at Toronto last season. Gone from the organization are Tyler Austin, Neil Walker, and Brandon Drury. Didi Gregorius will start the season on the injured list with a generous return date being July. This year we know all the names, it’s only a matter of where and when they’ll play. Joining Sanchez as backup catcher again will be Austin Romine. Assuming there’s not enough room or at-bats between first base and DH, only one of Luke Voit and Greg Bird will hold down the right side. AL Rookie of the Year runner-up Miguel Andujar will be at the hot corner. The Yankees appear to favor Gleyber Torres’ development continuing at second base, which is why newcomer/flier shortstop Troy Tulowitzki is here, but his health and production may determine which side of the bag Torres will see more of this season. Another newcomer, DJ LeMahieu, could see a lot of second base depending on Tulo’s health, and probably a lot of late-game defensive substitutions at both corners. Let’s take a look at each position and player more closely. Once upon a time, some Yankee talent evaluators thought a young Yogi Berra was shaky in his game-calling abilities. Yet with the backing of manager Casey Stengel and tutelage of coach and legendary backstop Bill Dickey, Berra gained confidence and became a legend. While the education of Sanchez continues, the expectations remain sky high. Limited by injuries and inconsistency in 2018, Sanchez allowed 18 passed balls and only had an OBP of .291. Although the pop was still there with 18 bombs, the Yankees need the all-around El Kraken, who came out gangbusters in 2016-17. The Yankees gave Sanchez a vote of confidence and FanGraphs projects him to have a .322 OBP and 28 home runs in 2019, which you’d take from your catcher in this lineup. Given the pop up-and-down the lineup, Gary’s defense and game-calling will be the most crucial aspect of his game this season. As for Romine, last season saw him step up in Sanchez’s absence as a more than competent major-league catcher and not just a stopgap body behind the plate. In theory, one would like Bird’s lefty bat to thrive and help balance the Yankee lineup. Yet we’re dealing with reality here folks, and that is Voit looks like he can mash. Down the stretch for the Yankees last year, Voit had a 188 OPS+ and Statcast loved him — the ball jumps off his bat with above-average exit velocity. I’m not saying his play down the stretch translates to 162-games, but it was enough to give him a second look and start the season at first base. According to FanGraphs, Voit projects to club 19 homers with a .336 OPB. Voit’s WAR projection of 1.4 to Bird’s 0.3 also says something. My defensive expectations of both are somewhere around the same neighborhood as Jason Giambi. The most encouraging thing to come out of their spring training battle (for whatever those stats are worth) is that the guy who gets the nod will have earned it, not because of the other guy completely flopping. Both have come out on fire, stinging the ball in camp. Initially, it looked as if there would be platoon opportunities it would be LeMahieu subbing for Bird, but with Aaron Hicks on the injured list, it appears both Bird and Voit will be on the roster. Depending upon whom is or isn’t in the outfield or at DH, there will likely be more regular at-bats for both. The Yankees are paying LeMahieu $12 million dollars this year and he’s a gold glove second baseman, but the focus here remains on Torres as the starter. When Gleyber was called up last season, it looked like he and the team was shot out of a cannon. Before injuring his hip, Torres, who was an All-Star and finished third in AL Rookie of the Year voting, looked like the best player in the lineup aside from Aaron Judge. Torres played in 11 fewer games than Gregorius and 26 less than Andujar, yet his 24 home runs were three fewer than their total of 27 apiece. According to the projections, Torres’ numbers are expected to take a dip — think how Derek Jeter’s numbers went from 1996 to 1997. Projections aside, if healthy Torres has the highest ceiling in this lineup of any player not named Judge. They either have a lot of faith in Didi’s healing abilities or no belief in Tulo staying healthy, because FanGraphs projects Gregorius playing in at least one more game than Tulowitzki this season with virtually the same numbers. In a loaded lineup, the biggest thing for me is how much range and movement does Tulo have left at short. If he doesn’t look good, things could get dicey on the left side, especially with three lefty starters and two lefty power arms out of the bullpen. Offensively I could see Tulo turn back the clock in April and May, but I wouldn’t count on any consistency from him because he has not been healthy in over two years. On a low-risk, high-reward signing, you’d take 9 home runs and a .311 OBP as a stopgap for around 60 games. Torres could shift to short if needed, and Tyler Wade has a ridiculous glove and range which could be useful on the left side of this infield. One could even see Wade deployed as a fifth infielder during a late-game situation with Zack Britton on the mound. Having a healthy Gregorius and his clubhouse presence return for the second half will be essential for a strong World Series push. Still young and a work in progress defensively, Andujar can flat out hit with authority. When you finish second in AL Rookie of the Year voting, break Joe DiMaggio’s franchise record for doubles by a rookie, and tie Fred Lynn’s major-league mark for a rookie with 47, you can clearly hit. Andujar’s 27 homers and .527 slugging percentage (seventh in MLB) is precisely the kind of thump you want out of the hot corner. As we all know, the defensive metrics and 15 errors are cause for concern. Andujar did work with his idol Adrian Beltre in the off-season, so one would have to believe he makes some strides. One potential worry is if Andujar’s confidence and pride take a hit as either LeMahieu or Wade looms as a late defensive replacement on a nightly basis. Conversely, his spirits should be sky high given the Yankees passed on Manny Machado. Like Torres, Andujar’s overall projections take a small dip as he enters his sophomore season. Even with Didi expected to miss the first half of the season, there is plenty of pop with this infield group. The key will be how Aaron Boone mixes and matches his defensive rotations. One often talked about aspect is the right-handed heaviness of this infield. With Gregorius out and Bird’s roster spot in question, the infield is all right-handed. Regardless, the versatility of the infielders should provide the Yankees a lot of value. The outfield may be the Yankees biggest strength of any group, as it contains the two most productive players on the team: Aaron Judge and Giancarlo Stanton, a five tool player: Aaron Hicks, and a superb defender: Brett Gardner. When healthy, this group of outfielders is phenomenal. A late addition to the roster is Mike Tauchman, who was acquired to be a backup outfielder while Hicks is sidelined. It’s tough not to project a monster year for Aaron Judge. This is the first offseason that Judge didn’t spend recovering from injury, and it shows. Judge is mashing in Spring Training and currently leads the Grapefruit League in home runs. Last year, Judge was on pace for around 40 homers when he got hurt at the end of July, and that was without any significant hot streaks or crazy home run binges. Any concerns about the injured wrist were quelled in the playoffs, where he hit .421 with three home runs across five games. Assuming full health, Judge should project to slash .280/.400/.560 with 45 home runs. If he goes on a couple of hot streaks like we saw in 2017, 50 long balls is very feasible given the lineup protection he has and all of the hitter friendly ballparks he will play in. The beauty of Judge is that he keeps improving, as seen in the above tweet. He is also an asset in the field, robbing home runs, gunning runners out on the bases, and using his long strides to take away would-be hits all over the field. A Gold Glove finalist in 2017, he should be right in the conversation for best defensive right fielder again this year. Also look for time split in the field with Stanton, as Cashman has stated he would like to see Judge get more half days off at DH. Unlike Judge, Hicks is a bit of a question mark. While he has improved every year since 2016, he has also spent time on the disabled list every season since. Hicks is already scheduled to miss at least the first series of the year depending on how his back progresses. There is no question Hicks is an above average center fielder when healthy. He has plus range, a cannon for a throwing arm, and tracks the ball extremely well. He has elite plate discipline with a .372 OBP in 2017 and a .366 OBP in 2018. A switch hitter with power, Hicks hit 27 HRs last year, a career high. One area where Hicks has struggled consistently is batting average. The Yankees claim to not value batting average as a statistic, but Hicks surely can do better than the .248 he hit last year. Despite the overall shift away from batting average by MLB scouts and executives, we just watched the Red Sox win a world series with a bunch of .300 hitters — batting average still matters to an extent. I don’t see why Hicks shouldn’t be able to match his .266 batting average from 2017. Conservatively, I am going to project Hicks at 125 games played, down 12 from last year but up considerably from the 88 he played in 2017. Despite having a great year in 2018, Yankee fans seemed a bit underwhelmed with Giancarlo Stanton. Coming off of an MVP season with monster expectations, it was pretty much MVP or bust with Stanton last year, despite turning in a very strong 38 homers and 100 RBI season. Like A-rod in 2005, Stanton should have a monster season in year two as a Yankee. Defensively, Stanton will see more time at the corner outfield spots, especially with Hicks out to start the season. I expect Stanton to see 50-60 games in the field, DH around 85 times, and get 15-20 games off for rest. He is generally regarded as a plus defender with a great arm and sneaky good range for his size. He plays a great right field and an adequate left field, making his versatility an added benefit to his monster bat, which should produce 40-50 long balls. The resigning of Brett Gardner immediately after the 2018 playoffs was met mostly with apathy by Yankees fans. Sure, Gardner is the longest tenured Yankee, but a miserable end to 2018 left him with a .236 batting average and a seat on the bench for the Wild Card game. Gardner also posted his lowest OBP since his rookie season in 2008, and his homers dropped from 21 in 2017 to just 12 last year. So why did the Yankees bring him back? Defense. Gardner is considered by some to be the best defensive left fielder in baseball. Yankee Stadium has a deep and spacious left field, and the Yankees truly value Gardner’s defense in death valley. His ability to grind out at bats and see a ton of pitches, combined with his tenure and love for being a Yankee, made bringing him back a fairly easy decision. Clint Frazier has been both exciting and frustrating in his three years in the Yankees organization. Despite his obvious tools, Frazier hasn’t made much of an impact at the major league level and will begin 2019 in Scranton. He had an exciting start to 2017, but a right hamstring injury slowed him and officially ended that season prematurely. Last year he suffered a concussion in spring training and never fully recovered, essentially missing the entire season. It’s impossible to project any kind of major league numbers for Frazier in 2019, but if he can fight his way onto the big league roster sometime in the second half, I’m sure the Yankee brass would be thrilled. It’s difficult to talk about Frazier without mentioning Gardner. The two could go hand-in-hand this season if the Yankees want to give Gardy more time off because he is notoriously a first half player. Frazier has made it very clear he wants the starting left field job, so a little healthy competition between the two could be a good thing. The only problem with this scenario is roster space — the Yankees outfield is packed. Assuming everyone remains healthy (fingers crossed), there are not many questions regarding the starting lineup. Troy Tulowitzki is the shortstop until Didi Gregorius returns and first base will be up-in-the-air until someone puts a stranglehold on it. Under the aforementioned assumption, the bench is more or less set as well. Many believe the Yankees will go with an eight-man bullpen, which would leave only three spots for the bench. Of these three, one will of course go to backup catcher Austin Romine. Another will go to DJ LeMahieu. The third spot is a little more in flux. Let’s dive into what to expect from these bench players, as well as debate who will round out the roster with the final spot. Really no question here that Romine makes the team, as he is the backup catcher. The 30-year-old backstop has done an admirable job in that role over the years, more so becoming known for his defensive work and ability to handle the pitchers. Due to injuries and struggles from Gary Sanchez last season, Romine started 68 games behind the dish. For the first time in his career, he posted an above-zero war (0.8). His power numbers also jumped in 2018, cranking 10 homers along with 42 RBI. His slugging percentage (.417) and OPS (.732) were also career-highs. He likely won’t get as many at-bats if Sanchez can stay healthy, but his bat has improved to the point where it is serviceable in Sanchez’s absence. DJ LeMahieu was brought in as a cheaper solution to the Yankees’ need for an infielder in relation to Manny Machado. Signed for two years at $12 million per, LeMahieu is a relatively expensive bench player. However, he gives Aaron Boone the versatility of being able to play multiple positions very well. His strongest position is second base, where he has won two consecutive Gold Gloves. He has exclusively played second the last four seasons in Colorado but has played 4 career games at first base, 4 at shortstop, and 41 at third base. LeMahieu also has a strong bat. He won the NL batting title in 2016, hitting a robust .348. Some attribute his numbers to the “Coors Field factor”, but he still hit .303 on the road that year. On the flip side, he has hit .266 away from Coors Field in his career. He is not a home run hitter (only 49 in his career), but he does hit the ball the opposite way more than the Major League average, which could inflate his power numbers at Yankee Stadium. It is still unclear what position DJLM will see the bulk of his action — 2B, 3B, or 1B. I think that depends on Tulowitzki’s health and Andujar’s defense. Fans can expect superb defense and a player who puts the ball in play up the middle and to the right side 75% of the time (sound familiar?). Wade was the last cut for the opening day roster. He had a strong spring but was passed over in favor of Tauchman, who is an outfielder by trade. One more from Tyler Wade: "It just blindsided me. I didn’t know what to say. I wasn’t expecting this whatsoever. I was very excited to get up there to New York and do whatever I could to help this team and I’m just disappointed that’s all." Wade is very versatile, having played every non-pitcher position during his professional career other than catcher and first base. He is considered a strong defender as well as a good baserunner. He featured a 28.8 feet per second average sprint speed last season, good for second on the team behind Brett Gardner (29.2). The only question surrounding Wade is his ability to hit at the Major League level. He has been regarded as a “Quadruple-A hitter”, having compiled a .282 career batting average in AAA but only a.161 average in the majors. Wade had a strong Spring Training in 2018 when he hit .282, but that translated to a .167 average once he broke camp with the big club. If he can bring his bat up to par with his other tools, he will be a valuable commodity off of the bench. Honestly, barring injury there are no other candidates for the bench. The first base battle between Luke Voit and Greg Bird resulted in both making the majors, but it seems like the Yankees don’t view that as a long term plan. Mike Tauchman will be here as long as Hicks is injured, and his 69 MLB plate appearances don’t tell us much. Barring more injuries, the position players on this team are fairly set. Much to the dismay of couch managers all over the Tri-state area, the Yankees decided to bring back the entire coaching staff in 2019. If you’re curious about things like the bullpen coaches and catching instructor, check out the rest of the staff here. Nevertheless, Boone still received plenty of criticism, mainly for his use of pitchers and handling of key players like Gary Sanchez. If I were grading Boone’s first year with the Yankees, I’d give him a ‘B’. Again, 100-wins and a playoff round victory (if you count the Wild Card Game as a round) is nothing to sneeze at. He dealt with many hurdles throughout the season. The aforementioned Sanchez had a lost 2018, Aaron Judge missed 6-weeks, Masahiro Tanaka missed a calendar month, and Shane Robinson played in 25 (!!!) games. The biggest problem for Boone is that his two worst managed games of his season happened to be the last two — game’s 3 and 4 of the ALDS vs Boston. It makes no sense to dwell on it now, except to say let’s hope Boone learned from his many, many mistakes on those two nights. 2019 will be Rothschild’s 9th with the Yankees, making him the longest tenured coach. On any given night there is a contingent of fans on Twitter screaming for Rothschild’s job, but the Yankees finished T-3 in the American League for ERA+ and had the most dominant bullpen in the game. Larry by no means had a perfect year. He was unable to connect with and fix Sonny Gray (who may have been unfixable) and Luis Severino had a disastrous end to his season when he infamously warmed-up late for Game 3 of the ALDS and got shelled thanks to him tipping pitches. One thing to keep an eye on with Rothschild are how newcomers James Paxton and Adam Ottavino perform. Another oft-criticized coach is the hitting coach (remember the #FireKevinLong movement?). Marcus Thames is entering his second season as Yankees hitting coach. I am interested to see how he handles this very powerful, and very strikeout-prone lineup. What adjustments will Stanton make to improve his consistency and plate discipline? How will Torres and Andujar adjust to avoid sophomore slumps? Will Sanchez rebound? Will Bird be anything? Was Voit a fluke? Can Hicks take another step forward? Most fans don’t really care about the coaching staff past the manager, but then again if you’ve read this far, perhaps you do. The reality is managers and coaches never deserve the blame they get when things go wrong. It’s a thankless job. Like umpires, if they go unnoticed by the fans then they are doing something right. And that’s it. Now you are ready for opening day.